A week or two ago I finally finished the first draft of the book I’ve been working on since the beginning of the year. The book is about what it means as a Christian to chase a dream. Specifically it looks at the lives of the dream-chasers in the Bible to learn a little bit about what works (and what doesn’t) when you’re chasing a dream that been put in your heart by God. I realized as He spoke that He was exactly right. I’d had a few other working titles since I started this project, but none of them hit the nail on the head the way this did. Because the truth is that everyone has dreams … EVERYONE. Everyone has something that they want to achieve or attain. We were made to fill this earth, to have dominion over it, and to subdue it. It is, therefore, in our nature to want to expand and achieve, to reach for something better. However, there is a vast difference between a dreamer and a dream chaser. We all have dreams, but there are precious few of us who are willing to put in the time and effort it takes to chase those dreams down. It takes a special drive and an unflagging character to push and to strive to achieve a dream, no matter what the opposition looks like, no matter how impossible it seems. But it precisely those people who have the character to chase their dreams, and to do it God’s way, that end up finding their success! You cannot become a failure until you’ve stopped trying. As long as you are pushing forward, as long as you are chasing after your dreams then every setback, every failed attempt is nothing more than a prelude to your success. Do you have a dream? Do you want to see it become a reality? Me too. Let’s go out there and chase them together! I hope you don’t mind, but I’m going to spend a little time being real in this post. I’ve been having some problems lately with my blog. It’s not that I’ve had a problem writing it – I’ve loved it 🙂 But I’ve realized recently that what I’m writing here, while relevant and interesting, has been incomplete. So I’m just writing this post as a bit of a heads-up. The tone and focus of my future musings on this sight are going to be shifting. It’s not that I won’t be writing about writing or blogging or book production or publishing or anything like that. I certainly will be. But I’ll be mixing a lot more of the spiritual in with the practical, if that makes any sense. Just earlier this week I got some incredible news and an amazing opportunity regarding the book that I’ve been working on for the past few years. On the one hand, I’m so excited that I can’t wait to tell you all. But on the other, I’ve realized that so much has happened since the last time I wrote about the book, that there’s a lot of catching up to do first. For starters – I’ve gotten some really amazing feedback and direction from a few key people (especially my mom) that has helped me crystalize and solidify the central argument that the book is making. That, of course, has meant massive re-writes (again), and a lot of time spent back at the drawing board (but in a good way). And as if that weren’t enough good news, just a few weeks ago one of the senior pastors at my church got wind of this project and asked for a copy of the book to read. Of course, I was incredibly reluctant to give her what still felt like a work in progress. But I ordered the proof copy anyway and gave it to her to read. Her feedback has been so positive, so encouraging, that it’s motivated me to push to actually produce a finished draft. And then just this week she called me into her office to share even more good news. She wants me to build a 12 week Bible study course around the book so that they can offer it (and I can teach it) during the next semester of Bible Institute in our church’s main location in Queens. When she first told me I was so shocked and honored that I couldn’t come up with an intelligent response. I think the words “that’s crazy” were the first thing that managed to come out of my mouth. And then of course I started crying. Because it really is a crazy gift from God, and it is so far beyond my wildest expectations of what might happen with this book that I still can’t really believe it’s happening. But I agreed. 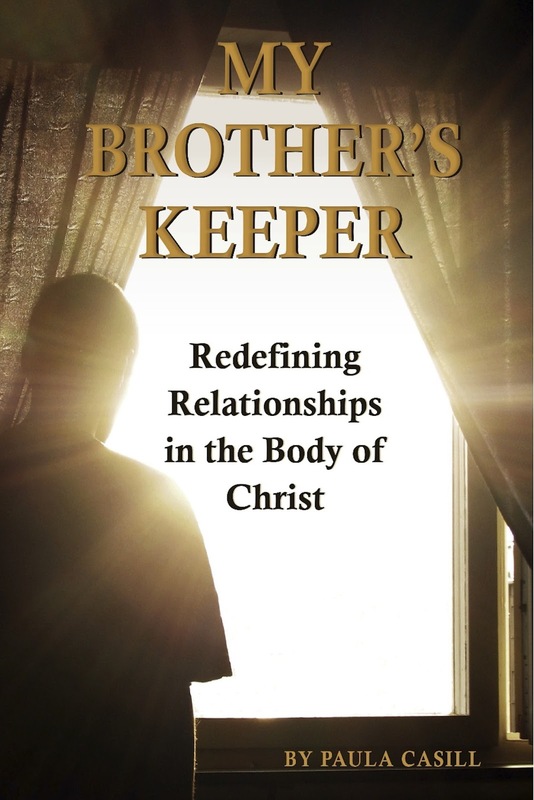 And next semester I will be teaching My Brother’s Keeper as a Bible Study course in my church. That means by the time the spring semester starts the book needs to be completely finished, published, and available for sale. I have 6 weeks. And suddenly it feels like I would need a year to finish everything I have left to do. And yet there is no question in my spirit that this is a God-ordained moment of opportunity. So even in the panicked scramble that I am about to dive into, I cannot help but find peace. If this is His plan, then it is in His hands. What better place could there possibly be? The funny thing about the doors that God opens (in my life, at least) is that they never come with a bang. They’re never big, awesome, public displays. They don’t normally look like the type of thing that should blow your socks off. In fact, most of the time they begin in the most mundane and ordinary of ways and at the most unexpected of times. In this particular journey, after six months of nothing, the last thing I was expecting was to see a door suddenly opening in front of me. But it did – and it all started with the most ordinary of occurrences – it started with a conversation. I was talking with my pastor and a few other people at a our weekly women’s Bible study. We were discussing a wonderful blog that’s written by our bishop’s wife and published on the church website, and my pastor mentioned that she wanted to find a way to turn it into a daily devotional book. As soon as she said it my ears perked up. The conversation continued around the topic – discussion what it would take to make it happen. “We could have it bound at Staples” was one comment that was met with some enthusiasm, and I suddenly realized that no one else in this little circle understood how doable this project was, or how quickly or professionally it could be completed. What’s more, they had no idea that I knew exactly what needed to happen to see it become a reality. So I started telling them about ISBNs and print-on-demand technology and a few of the other nuggets I’d discovered in my research. I think some eyes started glazing over – and I don’t blame them, I was in total nerd-mode and probably making absolutely no sense to anybody but myself. It wasn’t long before we moved on to another topic of conversation (coffee, I think). But I went home that night with the absolute assurance that this was something that I could do. And so I sat down that night (and for many nights over the four weeks that followed) and set to work “creating” this book. It was so liberating to be working on something that wasn’t my own writing – the freedom and the joy that it gave me was frankly surprising. And as I worked on the book I found myself diving back into my research on publishing. I went back to re-learn everything about what makes a book good (and it’s so much more than the writing!) But this time around my mind was like a sponge. I just couldn’t get enough. My brain was whirling around at a mile a minute, filled to the brim with a wealth of new information. And the best part was that I had a project waiting for me – one that allowed me to put into practice every single new tidbit of knowledge that I came across. It took several weeks to do all of the editing, formatting, and layout work. Who knew that font selection and line spacing would become so important to me? But finally it was done. I surprised my pastor with a pdf of the final product (she didn’t know I’d been working on it) and then I waited for … well, I didn’t really know what. The funny thing was that with all of the work that I’d poured into this project, I had no defined expectations of what would happen as a result. I hadn’t even thought about who might see it or what they’d think. I’d just worked on it for the sake of working on it. It was something that I could do for my pastor, for her pastor, something that might bless them or help them. And it was something that I knew that I had the resources to complete. Sitting back when it was over, waiting for whatever response this little project was going to receive, I marveled at the way that God had orchestrated this whole thing. The story was far from over, and my biggest breakthroughs were still on their way. But in that moment I felt so blessed. I saw how God had orchestrated the past few years of my life in order to prepare me to complete this task. I suddenly felt as though everything was clicking into place. God had set me up to pick up all sorts of obscure and practically useless knowledge along my way, because He knew full well that the day would come when I would have the opportunity to put that knowledge to use for His glory. But isn’t that so like God? He knows the task that is waiting for us 1, 5, or 20 years down the road. He knows the tools we will need to be successful. And He is so faithful that He provides us with those tools often long before we even realize that we need them. The junk that we’ve collected over the years – the experiences, the trivial knowledge, the random expertise that seems completely useless … all of those things are given to us by God for our benefit and for His glory. He is the grand designer, and He knows every tool, every cog, every instrument that we require. He isn’t IKEA. He doesn’t leave us with extra pieces at the end of our journey. He is precise, He is exact, and when the pieces of our lives begin to fall into the pattern of His plan … well, it’s a breathtaking thing to behold. Here’s part 3 of last year’s posts on this incredible experience of writing my first book. So where did we last leave off? If I recall correctly (and I know that I do, because I just went back to check) I had just realized that God’s purpose for this whole adventure was significantly bigger than I had first imagined. I was holding a secret, a beautiful secret of a dream that I’d never even imagined wanting before. It was impossible, it was insane, but it was there. And in the meantime I was working on my manuscript, trying to turn my mess of words into a clear and precise expression of the powerful concept that God had placed in my heart. And slowly but surely pieces were beginning to fall into place. The hodgepodge of styles and ideas were starting to mesh together into something resembling a cohesive argument. My words were starting to resemble a book! But this is the point when things started to get hard – incredibly hard. Here’s what would happen. A friend or acquaintance would ask me what I was up to, and I would start to tell them about the book. They would get excited and ask me if they could read it. I would gladly say yes, tell them how eager I was for input, and then print out (or e-mail) the latest draft for them to read. And then … nothing happened. I wouldn’t hear back. I would wait for a response for a month or two and then finally ask them about it. Their response was always the same: “Oh yes, I started to read it, but then …” not one person I spoke to was able to tell me that they’d read the book through to the end. Not one person was able to give me any kind of feedback whatsoever. I can not express how frustrating it became. Now before my friends and family read this and think I’m upset with them I need to clarify that I’m not. I know, in all fairness, that the vast majority of these people were not avid readers – at least, not readers of this type of non-fiction. This isn’t the type of book that they typically gobble up, and most of the time their eagerness to read it at all came more from their friendships with me than from an interest in the topic. And aside from all of that I know without doubt that this was the way God designed the situation to happen – so how could I possibly be upset with anyone for doing exactly what He’d planned for them to do? But in the midst of all of this, as it happened over and over again, the pattern was more disheartening that I can put into words. I would work on a draft, run into someone who offered to read it, give it to them, and then hear nothing back. And so I would go back to the manuscript and work through another draft – trying to make it better, more captivating, more un-put-down-able. But the response never changed. It happened with my mother, my closest friends, my father, people from church … everywhere I looked there was someone who offered an open door that inevitably led me right into a brick wall. And the longer I went without any form of encouragement or critique the more the doubt and fear began to nibble at the edges of this dream. I knew God was faithful – but I began to wonder if I was doing something wrong. If I couldn’t get my friends to read this book, what were the chances that a stranger would care enough to pick it up, much less finish it? And how was I ever going to get it published, distributed, and sold if I wasn’t even able to find supporters among the people whom I’ve always relied on? At this point in my (I won’t say “panic” … let’s go with “struggle”) … at this point in my struggle I began, for the first time, to seriously consider the idea of self-publishing. The very words “self-publishing” still send shivers down my spine – they conjure images of failure and mediocrity that harken back to those mailings I used to get in high school (We’d like to publish your poem – just send us $100 for your copy of the book). Of course, now I know that self-publishing has undergone tremendous changes over the past ten years, and that the quality of self-published work has changed dramatically, but it was certainly my perception at the time. And no, I hadn’t abandoned the idea of working with my church to start their own publishing house, but that dream was still so far over my horizon that I’d never seriously considered connecting it to my current project. So I started doing research in between revisions. I learned about self publishing, co-publishing, and what it takes to start a small publishing company. I learned about the difference between “self publishing services” and websites that expected you to do all the work on your own. I learned about buying ISBNs, about marketing and distribution, about print-on-demand technology, and about book layout and cover design. I learned more about the production of a book than I’d ever imagined possible. I spent weeks pouring over an incredible amount of data, and then one day I just stopped. It wasn’t like I quit. It wasn’t an intentional decision. I had just printed out paper copies of my latest draft, just heard back from another friend who wanted to read the book, just sent her a copy, and was waiting (again) for a response. And so I took a break for a week – and that week turned into many weeks. Soon it was six months, and I hadn’t so much as opened the envelope where my latest paper manuscripts were waiting for me. That was last October, and until this April that was as far as this story went. I was at a standstill, and there was nothing left for me to do. I felt like I was idling at a red light, just waiting for it to change to green. But the more time I spent away from the whole thing, the less stressful it all became. Yes, I still felt passionate about the topics my book discussed, and yes there was a piece of me that was still hungry for progress. But in my soul I had nothing but peace. I knew that this journey wasn’t over. But I also knew that it wasn’t going to work in my time. I think that’s the biggest lesson I learned from this period of frustrating silence and brick walls – that I would never be able to force God’s hand to move in my way or my time. I knew that these dreams, these plans weren’t mine – they were His. And with that knowledge came the assurance that He already had the answers in place. He was going to give me exactly what He wanted, and when He did it was going to be glorious. But until that moment, the best thing that I could do was learn to wait on Him. Here’s the second of the posts that I’d written a year ago about the incredible journey I’ve been on in writing my first book. After I’d finished the terrible first draft of the book, I set myself to the tedious task of editing the content. At first I thought it would be a simple matter of polishing a few rough patches, but as I read through the text from beginning to end, the lack of flow really began to stand out to me. I had done exactly what I’d imagined at the beginning of this process – I’d effectively written a dozen super-long blog entries. They all worked as stand-alone pieces, but when I tried to patch them all together it became evident that they weren’t really fitting. Now I don’t know about anyone else, but for me editing my own work is painfully difficult. I’m fine with working on someone else’s text. I was a writing tutor in college, and I’d always considered it my specialty to help student develop cohesive arguments and put them on paper. I can’t diagram a sentence to save my life, but I’ve always been able to tell you when a sentence or paragraph felt “awkward”. But when I already know what I’m reading – when it’s something I’ve written, it takes an active concentration to dig those pieces out, and a lot of work to re-imagine how they might fit together better. So for the next six months or so my progress became difficult and slow. I would work through a draft for several weeks, and then put it away for a week or two. Then I would come back with a fresh perspective and find a whole new mess of problems. I was playing author and editor at the same time, and the work seemed endless. At the same time, in order to remind myself of what good writing sounded like, I started to pick up other Christian books from my shelf that I hadn’t read or hadn’t read in a while. One of those books (again, there is a blog entry about this somewhere in my archives) was What You Do Best in the Body of Christ. I’d started reading it years before, and put it down after a chapter or two. But this time as I was reading through it God began to speak to me in a very real and personal way. So much of what was written was so based in practical common sense that it seemed almost foolish, but these logical and “obvious” statements inevitably led to questions that I’d never sat down to actively consider, and they were questions that needed answers. The essential premise of the book is that we are each given a specific mix of personality, passion, and talent that God desires to use for His glory. Finding the right way to use that mix is what will make us successful. For example, not everyone who has a passion for evangelism is going to pursue it in the same way. Some people love approaching strangers on the street, but there are others who are more comfortable inviting their neighbors over for coffee, while others were “born” to preach to large crowds of people all at once. Finding the right way to use your gifts in pursuit of your passion is key to following your call. Like I said – common sense, right? But as I went through the exercises that the book suggested, and as I wrote my results down on paper and looked at them, it was like God was ripping a curtain away from an entire realm of possibilities that I’d never considered. There were connections that were obvious, ministries into which I’d already fallen, work that I was already doing. But at the same time God was revealing a path that I’d never even thought to consider. If I tried to explain the dots that God was connecting in my head it wouldn’t make any sense, but they were there, and they were so clear that He might as well have written them out for me. I was going to help my church start a publications ministry. I was going to help them write and publish books, curriculums, and literature that could be read and used by the Body of Christ around the world. Now anyone who knows me will know just how crazy that sounds. I’m an accountant. I have NO experience in publishing, and NO idea how that kind of business is run. I’m not a terrible writer, but that’s like wanting to start a record label and expecting to be successful because you’re not a terrible singer. And on top of all of that I go to a smaller suburban satellite congregation of a much larger church in the city – it’s not exactly like I have easy access to the pastors to be making these kinds of out-of-the-blue propositions. But there it was, as plain as day, and as soon as I saw it, it began bursting in my heart and my spirit like a bottle of soda that had been shaken and then opened. It was impossible, absolutely absurd, a task to which I knew myself to be uniquely suited, and for which I was absurdly unqualified. And yet somehow I knew that it was so right, so divinely inspired, that there could be no question. There it was – the broader vision. I had started this journey with an idea that I thought was big: I was going to write a book and get it published. I was going to put words on a page that would help other Christians with their daily lives. But God’s idea was bigger – so much bigger that it had never even entered into my realm of thinking. It was still impossible, still absurd, but now it was there – like a seed that had been planted. At this point there was nothing for me to do but to continue on the path that God had set me on. And so I took this seed of a vision and I wrote it down. I prayed over it. And I set it in my heart. And in the meantime – I continued to work on the book. But this time it was different – I wasn’t an author struggling to edit my own work any more. Now I was a future publisher, learning the ins and outs of editing from the perspective of an author as well as an editor. Suddenly this monotonous task (and believe me, it was monotonous) was no longer a drudgery, but an incredible learning opportunity. God had given me a broader vision, and it had changed my whole perspective. It seems strange to be starting this blog so far into my journey as a first time writer/indy publisher. So I’ve been struggling on how to begin. And then I hit a moment of (relative) genius: I decided to begin with what I’ve already written! So I pulled up the entries I’d posted to my personal blog to copy them over here. And funnily enough, I discovered that the first entry was posted exactly one year ago today! So much has been happening over the past few months, and I’m just bursting with the incredible news of it all, and so if it’s all right with you (and since I’m not waiting to hear, I’m going to presume it is), I’d like to venture off my beaten track and take the time to get a little more personal. This whole story will probably take me several posts to finish, but it all started right here on this blog. It began with a post I wrote almost two years ago entitled My Brother’s Keeper. But the point of this post isn’t to reference that one. The point of this post is that when I wrote that one so many months ago I had no idea what kind of crazy journey it would take me on. I had no clue how that first step would bring me to where I stand here and now. You see, as I wrote that post God began to stir something inside me – I realized that this topic was bigger than a few paragraphs could cover. What’s more, I realized that it was a topic that I felt very passionate about, an issue that I felt highlighted such a need within the Body of Christ – the need to define and examine what qualifies as rightly relating to one another. I look back at my self in that blissful state of ignorance and I can’t help but shake my head and laugh piteously at that silly young woman who clearly has no clue what a rough road she’s about to travel. Nevertheless, it was with ignorant bliss (as well as loads of encouragement from friends, family, and even my pastors) that I forged ahead into the writing process. It took me two months of constant work to put all of my thoughts on paper. I wrote a chapter at a time, sometimes switching from one to another half way through when I got stuck or bored. At the end what I had was 12 chapters, 90 pages, and an absolute mess on my hands. I mean it was awful. The ideas were all there, but they were cobbled together in such a haphazard fashion that they weren’t even identifiable. There was no continuity from chapter to chapter, the book lacked a style, it lacked an arc – it lacked a compelling through-line. It was a mess. Of course, having just devoted myself to 60 long hard days of furious writing, I had lost any sense of objectivity. And so, still blissfully ignorant, I merrily sent the first draft of the manuscript to my mother for her opinion. She agreed to read, critique, and help me edit. And then she read it … and informed me that she didn’t think she was going to be able to work with me on it after all. At that moment I felt so down, so defeated. I felt like an utter failure, and I couldn’t understand why God would ever press me to start something like this if I was going to be so bad at it! But that’s the thing about beginnings. We expect our first steps on a new path to launch us up into the stars – and sometimes they do. But more often than not, they leave us not far from where we started. Sometimes we end up like David, who’s journey to the throne started when he was suddenly anointed by Samuel the prophet, and then just as suddenly found himself back in the field tending his sheep like nothing happened. Sometimes we end up like Moses, who had a conversation with a bush in which God FORCED him to return to Egypt, only to meet resistance at every turn as soon as he arrived. But we don’t remember David as a shepherd boy – we remember him as a giant slayer and king. When we tell our children the story of Moses we don’t dwell on how miserable his situation was, we focus on the triumph of his success. And if this (much humbler) journey that I’ve been taking has taught me anything, it has been that God is less interested in where our first steps take us than He is in where they will eventually lead us. So I guess I’ll end this first post with this: If God has you at the beginning of something that seems to daunting for words, don’t worry about it. Just keep putting one foot in front of the other, because God is setting you up for a breakthrough. He’s setting you up for success in ways that you won’t understand, and preparing you for things that you don’t even know are coming. So don’t despise your small beginnings. They are the first steps into your greatness.